The Yangtze River in 1987 and 2006. The dam and large reservoir it created are visible in the 2006 Landsat 7 image. 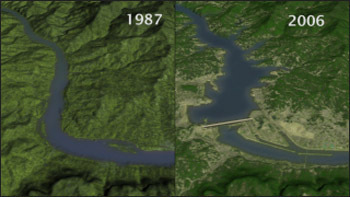 Animations showing the drastic changes made by the dam are available through NASA’s Science Visualization Studio. Image Credit: NASA SVS / USGS. Jun 14, 2007 • Some call it the eighth wonder of world. Others say it’s the next Great Wall of China. Upon completion in 2009, the Three Gorges Dam along China’s Yangtze River will be the world’s largest hydroelectric power generator and one of the few man-made structures so enormous that it’s actually visible to the naked eye from space. Landsat satellites have provided detailed, vivid views of the dam since construction began in 1994.
he Yangtze River is the third largest river in the world, stretching more than 3,900 miles across China before reaching its mouth near Shanghai. Historically, the river has been prone to massive flooding, overflowing its banks about once every ten years. The dam is designed to greatly improve flood control on the river and protect the 15 million people and 3.7 million acres of farmland in the lower Yangtze flood plains. Observations from the NASA-built, USGS-operated Landsat satellites provide an overview of the dam’s construction. The first image shows the region prior to start of the project. By 2000, construction along each riverbank was underway, but sediment-filled water still flowed through a narrow channel near the river’s south bank. The 2004 images show limited development of the main wall and the partial filling of the reservoir, including numerous side canyons. By mid-2006, construction of the main wall was completed and a reservoir more than 2 miles (3 kilometers) across had filled just upstream of the dam. Engineered to store more than 5 trillion gallons of water, the Three Gorges Dam is designed to produce more than 18,000 megawatts of electricity when all 26 turbines become operational in 2009—twenty times the power of Hoover Dam. The reservoir will also allow 10,000-ton freighters to enter the nation’s interior, opening a region burgeoning with agricultural and manufactured products, increasing commercial shipping access to China’s cities. While Landsat is a premier research tool for observing changes on the Earth’s surface, other NASA satellites are also helpful in determining how changing land cover and use may influence climate and the environment. Just as transforming forested lands into cities can change the local climate, scientists have found evidence that Three Gorges Dam and its enormous reservoir might have a similar effect. In a recent study, researchers used computer models and data from NASA’s Tropical Rainfall Measuring Mission satellite to estimate how the dam’s construction impacted area rainfall. Information from NASA’s Terra and Aqua satellites also revealed the dam’s effect on land surface temperatures. “The satellite data and computer modeling clearly indicate that the land use change associated with the dam’s construction has increased precipitation in the region between the Daba and Qinling mountains,” said lead author Liguang Wu of NASA Goddard Space Flight Center, Greenbelt, Md., and the University of Maryland – Baltimore County. The land changes also reduced rainfall in the region immediately surrounding Three Gorges Dam after the dam’s water level abruptly rose in June 2003. The researchers were surprised to see that the dam affected rainfall over such a large area — a 62-square-mile region — rather than just 6 miles projected in previous studies. Land surface temperature changes were also found to occur in the area where more rain fell. In the daytime, temperatures between the Daba and the Qinling mountains decreased by an average of 1.2 degrees Fahrenheit (0.67 degrees Celsius). Where there was more rainfall, there were more clouds, which reduced the amount of sunlight and heat that reached the land surface, creating cooler daytime temperatures. The study suggests that the cause of these temperature changes was the expansion of the width of the Yangtze River and the formation of the dam’s reservoir. After construction, a 401-square-mile reservoir formed in the mountainous area. Before the dam, the Yangtze River was only one-third of a mile in width. The larger mass of water created a “lake effect,” causing cooler temperatures and increased rainfall between the Daba and Qinling mountains, but less rainfall in the immediate vicinity of the reservoir. When the dam becomes fully operational in 2009 and the reservoir reaches its peak size, scientists predict these regional temperature and precipitation changes may increase even more. The 2006 study was published in the American Geophysical Union’s Geophysical Research Letters. As the world’s landscape continues to evolve, NASA satellites will be there to monitor and better understand its effects. The next in the series of Landsat satellites — the Landsat Data Continuity Mission — is planned to launch in 2011. Landsat satellites have orbited the Earth since 1972, collecting valuable information on Earth’s surface to support global change research and applications in agriculture, business, science and government. These data constitute the longest record of Earth’s continental surfaces as seen from space. This entry is filed under Energy, News, Science, Water.